This enables you to use Scratch without an internet connection. Click on the link and follow the instructions. Try the first puzzle. If you need help, click on “Flappy Intro” at the bottom left of the screen for a short video clip. Click on an object, then the read the instructions. Type a new number (or "variable" - see page 12 of your book) to change how the object moves. View or print out a pdf with step-by step instructions. On the Scratch website, click on the blue "Start moving" button on the far right of the screen and follow the instructions to make the cat move. After you have done this, click on "Step Index" for lots more simple programs. Click on "All tips" on the far right of the Scratch website, then choose a tutorial. For more tips and information, click on "How To" or "Blocks". Once you feel confident with Scratch, try some of these activities. You can try two sample projects from each course without logging in. CoderDojo is another worldwide group of volunteer-led, community based programming clubs for children, aged 7 to 17, where they can learn how to code, develop websites, apps, programs, games and explore technology in an informal setting. Scroll down to find out more and play a game. Scroll down and choose a cartoon video clip that interests you. A fun introduction to what can be seen as quite a technical subject. I really liked the lift the flap game on the giving instructions page, which is where Pixel the Pirate has to be helped to find the treasure by following the instructions. Computer languages, such as Scratch, are very well introduced, and at a level that would be suitable for any junior school child (aged 7-11). There are links to Usborne's online activities too - very useful. With its equal mix of quirky facts and puzzles to try, Lift-the-flap Computers and Coding provides a whole new technique for learning how computer coding runs... The use of flaps and colourful cartoon-style illustrations helps bring a really difficult topic to a level children can master and many adults will find it useful too. A good, useful guide and helpful for young coders. A colourful and straightforward introduction to computers and how they work...There is a light touch throughout, with plenty of humour and quirky facts, games and puzzles. A really first-class introduction for a wide age group. The lively and highly visual presentation makes sense of what can be a tricky and complex topic - many adults will find it of interest too. It's an ideal way to foster children's interest in computers and to help their understanding so that they can get the most from their computing lessons at school. A child-friendly intro to how computers are built, what they do and how they work. 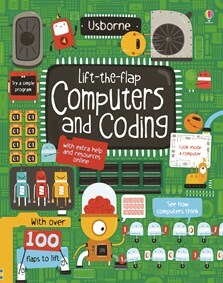 Introduce your child to a vital subject the fun, (old school) interactive way with this colourful lift-the-flap guide to computers and the basics of coding.